On behalf of the members of the new Executive Committee I want to thank you for your vote. We feel extremely honored by your trust in us. Your decision means a really big challenge and we are aware of this responsibility, which we will respectfully accept. 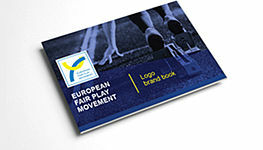 To an appreciative recognition within sports in Europe. Carlos Goncalves and Manfred Lämmer. On behalf of all of us, thank you very much for your ambitious work since 1994. 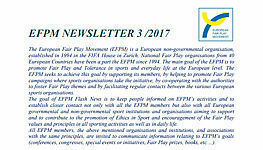 Your continues engagement for Fair Play values and principles in sports, your outstanding knowledge in the fields of sports, your experiences with and relationship to sports science and European sports bodies have undoubtedly been remarkable contributions and of the utmost importance for EFPM development, a really pleasant process from the very beginning.. Personally, I have to express my gratitude for your kindness and friendship all over the years. You will always be welcome as part of EFPM family. 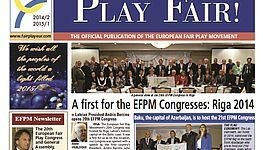 Now, I think, is the right moment to propose the announcement of Carlos and Manfred as EFPM Honorary Members. Fortunately, some work, tasks and duties are left for the EC in the future. Gaining a permanent headquarter, a professional run office. I mentioned just some of the important challenges we are facing. It`s up to us, to discuss the different issues and develop a concept, a masterplan of action for the main tasks and duties to be solved in the next years. I am absolutely convinced, we will take the right way for a promising EFPM future, if it is definitely based on continuous and close work between the EC and all EFPM members. Be sure, we will do our best, but we need your contribution and full support, even more than in the past, to realize our ambitious aims and goals.